Bench Mark on corner of Nassau and Washington Streets in Princeton, New Jersey altitude 194 feet -------------------------------------------- Reasons for balloon apparatus warming up as it reaches high altitude (greenhouse enclosed appartus) (a) slight increase in solar intensity ([?]) ((b) Less "wind" past appartus due to slowing or cessation of rate of use (c) diminution of convective cooling -- i.e., reduced convective heat transfer from apparatus to wall of greenhouse due to lower air density (?). (d) diminution of conductive cooling. 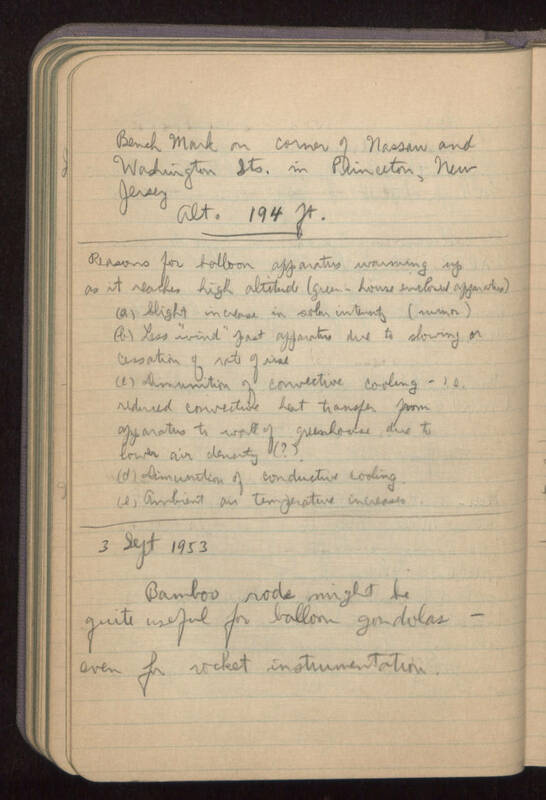 (e) ambient air temperature increases ------------------------------------------ 3 September 1953 Bamboo rode might be quite useful for balloon gondolas -- even for rocket instrumentation.